Finally, our late bloomer, Zoe, has started to fly. It has not necessarily been smooth sailing or landing, but she is improving. She first landed on the City Centre which is next door to the bank. This is an easy first spot since there is a big open roof, she can see home, the parents can see and feed her, and usually the Peregrine Patrol can keep tabs on her as well. We often spend hours (or days) watching these youngsters to be nearby in case the first flights go awry (as they often do). Kudos to Andrea who was on watch when she tried a flight and landed on the entrance drive to the top level of the parking deck. It was quiet and there was not much traffic, but Andrea was able herd her to a safer spot away from any potential harm. 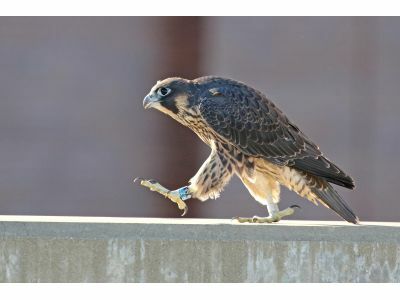 Then, Andrea was able to head off an enthusiastic falcon fan running toward the bird, intent on a photo. A chick who has very limited flying skills could easily be spooked into taking a flight that she was not able to maneuver. The photo op turned into a cordial learning op. I am sure that mama Rebecca is grateful that Andrea stepped into protector mode twice within a few minutes of time. After the excitement on the parking deck, Zoe tried to return to the safety of the City Centre roof, but did not quite have enough elevation to reach the roof and slid down the wall and spent the night on a narrow window ledge. The building residents were very good sports about hosting an unexpected overnight guest, especially when they were probably wakened by the loud and insistent calls of a very hungry young falcon at 6 AM. She had a few short flights and rough and/or aborted landings throughout the day but made it to a safe roof by evening and was joined by both of her sisters, who are flying quite well at this time.